Training your new puppy can be relatively easy if you remember two simple things. First, accidents WILL happen. Be patient with your puppy. Second, never, ever scold a puppy for accidents in the house. Be patient with your puppy. I repeat, NEVER ever scold a puppy for accidents in the house. After all who’s fault is it really? Who wasn’t watching their puppy? Instead try and catch them in the act and give a firm but gentle “NO” or “AH AH” and quickly do these 4 things…. 4. Head outside to designated potty area. Always reward and praise like crazy when they eliminate outside. Puppies do what works for them. 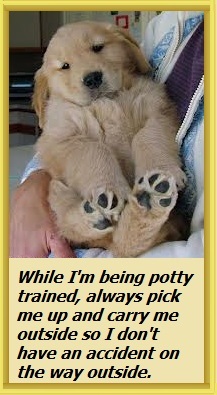 If you make going potty outside super fun and exciting, the whole training process will be faster with fewer accidents. Reward ONLY if the puppy goes potty. NO POTTY, NO TREAT. When the puppy is done take the leash off and let the puppy run around outside for a further reward. NO POTTY, NO OUTSIDE PLAY. 1. A young puppy should be supervised at all times. If your too busy to watch the puppy while it’s loose in the house, it should be in a crate or small enclosed pen or the leash tied to your belt. Let me repeat that…. While in training you MUST watch your puppy at ALL TIMES when loose in the house. 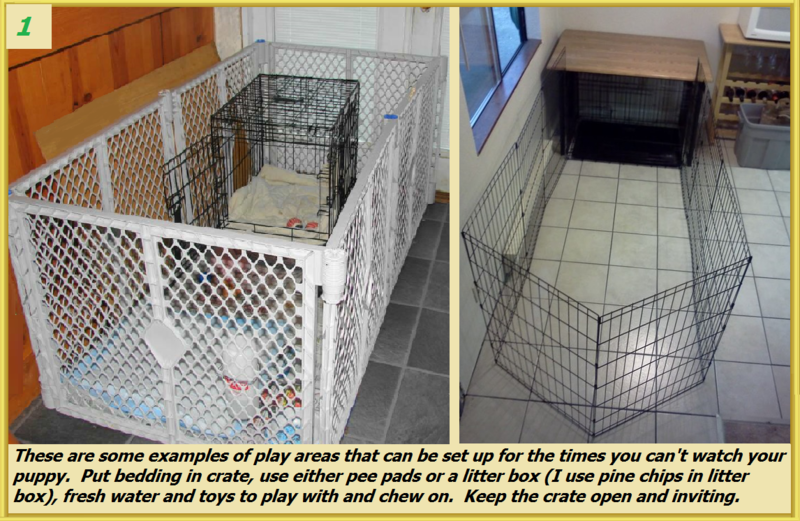 Use crates, gates or even tie the leash to your belt if you can’t supervise the pup. 2. At night the puppy should sleep next to your bed, in an appropriate sized crate, for it’s age. If the puppy makes a fuss at night to go potty, you’ll hear him/her. If at night the puppy starts crying, drop your fingers down and stick your fingers into the crate. If the puppy is just lonesome, it will be comforted by your fingers, knowing your there and go back to sleep. If it truly needs to go potty it will continue to cry. 3. You must go outside with your puppy, day or night. Always have treats and a leash with you. If you prepare treats in advance and have a leash by the door, your job will be easier. When your puppy urinates outside, put a word or phrase to it like “Go Potty”. The second the puppy finishes going potty, PRAISE, PRAISE, PRAISE and give a treat (timing is everything). Same routine for defecation, say “Go Poop” and Praise and treat. You must praise and reward ALL outdoor pottying. NO POTTY, NO TREAT. 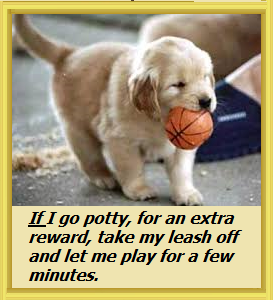 If the puppy goes potty or poop after the praise and treat, take the leash off and let him play outside. NO POTTY, NO OUTSIDE PLAY. 4. Stick with a feeding schedule. Feed at the same times everyday. Pick up the food after 10 minutes. NO FREE FEEDING. When the puppy is done feeding or drinking pick the puppy up and head outside for potty and afterwards if he’s pottied, some outside, leash free play time. Don’t forget treats and leash with you. 5. Don’t feed the puppy anymore food for the 3 hours leading up to bedtime. Always leave fresh water our for your puppy, but pick his water bowl up 3 hours before bed too. If the pup plays really hard and is very thirsty, give just a little water. Don’t let them tank up before bed. And NO water or food in the crate. 6. In your happiest voice, use a key word when your headed outside, like “we’re going “outside“ . It’s also a great idea to hang a bell on the door you use. Make sure it’s low enough for the puppy to reach. The bell will sound off every time you open the door. Your puppy will soon associate that sound with going outside. 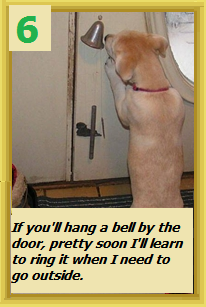 Before you know it the puppy will be ringing the bell to go outside. Works like a charm. Also pick key words for urination and defecation and say them outside to encourage the puppy. Some good words would be “Go Potty” and “Go Poop”. Soon the puppy will eliminate on command, when they learn the key words. 7. If you catch the puppy IN THE ACT of eliminating in your house, CLAP YOUR HANDS to distract him, say in a firm but not scary voice “AH AH” or “OUTSIDE”!! Immediately rush to the puppy, pick the puppy up, attach a leash, grab treats and take to the puppy to designated potty area outside. Your tone of voice should change as you head toward the door. Your tone should now be a happy, upbeat tone as you say “outside”. Set the puppy down outside, leash attached, in designated potty area. If the puppy finishes the task he started inside the house by going potty some more, praise and treat. NO POTTY, NO TREAT. Take the leash off and let him play. NO POTTY, NO OUTSIDE PLAY. Always pick the puppy up and put a leash on for controlled potty. Designate a potty area outside and always go to that area. Pick key words for the elimination task and use the same words every time. Prepare treats in advance so all you have to do is grab a few pieces on your way out the door. 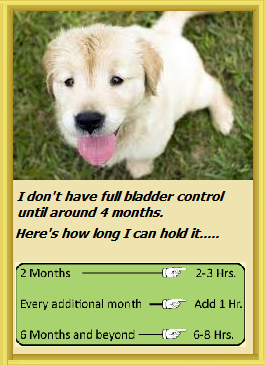 Puppies don’t have full bladder control for about 4-5 months. A good rule of thumb is a pup can hold its potty the same amount of hours as is his/her age. If the puppy is 2 months, he can hold it 2 hours. 3 months, 3 hours and so on. Never scold your puppy for accidents. This will do far more HARM than good. without a few accidents the puppy wont understand its not a desired behavior. Supervise your puppy when loose in the house. A puppy will absolutely have to go potty after it wakes from a nap, after it plays hard, and after it eats or drinks and probably in between. These are key times not to hesitate to get the puppy outside quickly. You will soon recognize the puppy’s “potty dance”. The potty dance is usually a few tight circles coupled with sniffing the ground. Attach a bell to the door used. NO POTTY, NO TREAT. NO POTTY, NO OUTSIDE PLAY TIME. Attaching the leash to your belt is a great way to train. 2. REWARDS: ALL outdoor elimination MUST be observed and rewarded. If you only do this ONE thing, your puppy will get housetrained. 3. PATIENCE: Anger and punishment have no place in dog training. Elimination is a natural and pleasurable experience for your dog. You can teach her to not soil your house, but punishment will NOT help. It will only teach the dog to hide when she needs to eliminate. If you have applied these techniques carefully for 4 weeks and you are still finding spots or piles “after the fact“, it’s time for stronger measures. 1. 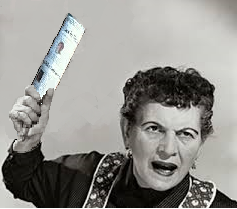 Roll up a newspaper very tight and fasten both ends with a rubber band. Keep it handy in an easy to reach spot. “I SHOULD HAVE BEEN WATCHING MY PUPPY”!